This has to be one of the most beautiful, elegant and glamorous bathrooms I've ever seen! Let's start with the upholstered double doors trimmed with silver nailheads - hello! 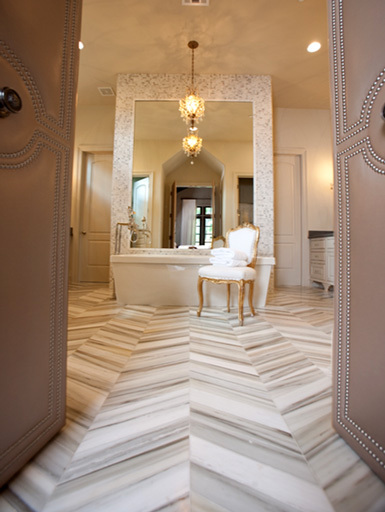 And the marble tile floor in a herringbone / chevron pattern is gorgeous. Then there's the large soaking tub, crystal chandelier and gold French Lois chair...pure luxury :) I could spend all day relaxing in this space. What do you think about this bathroom? That bathroom is to die for! Thanks for sharing! This is GORGEOUS! I love the floors and the double doors finished with the nailhead pattern is just spectacular! Thanks for sharing this gorgeous inspiration! That is my darling friend Julie!! Isn't that bathroom FABULOUS?! I can't get enough of those doors. I think I could come home to this .. slip into that tub and stare up at that chandelier with a glass of champers in my hand. Sigh! Omgosh...it is ALL so gorgeous !! But that floor is SO stunning ! Oh my goodness, I love herringbone style floors, but when I looked closely that is marble they used, I LOVE THIS! Almost like little arrows drawing you into the space! Great find! I think it's beautiful. I posted about it in my "double doors" post. Something about to doors opening up to a space is already luxurious in itself, but to have that bathroom's interior greet you is pure indulgence.